Some really cool new gadgets were displayed during the CES 2012 as expected, so it’s probably a bit funny that I’ll be zoning in on a mouse of all things. This mouse is, however, no ordinary mouse. In fact its a mouse that any gamer who is seriously into action-RPG and MOBA (Multiplayer Online Battle Arena) games. 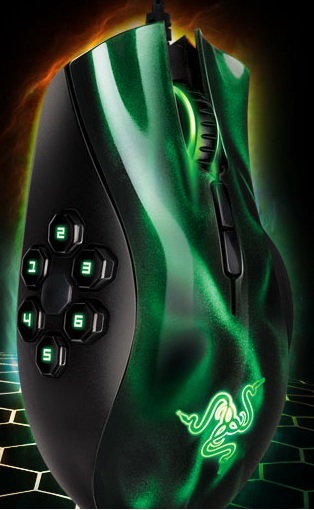 The Razer Naga Hex, which is obviously from Razer, the same company that gave us the Razer Blade, has six weird honeycomb-style “mechanical thumb buttons to bind all the necessary spells, skills, and items to take down the competition and complete every quest victoriously.” This obviously reduces the clicks you have to make, making you far more efficient during battles and quests. It is not the shortcut buttons that make this mouse stand out though. When it comes to tracking precision, you can say that it is as precise as you’d like it to be with its 5600dpi laser sensor designed specially for accuracy and precision. Hands-on reviews have also praised it for comfort, which anyone who has spent hours on end gripping a mouse know is just as important as any performance metric. Aside from the buttons, precision tracking and comfort, anyone who takes a second to glance at the Razer Naga Hex will be immediately drawn to the alienish green mouse. So if you’re looking for the perfect mouse for the Razer Blade, this is it. You don’t have to wait much longer for it to come out either because its coming in stores next month.